Roth’s work is from his series entitled Multi-Touch Paintings (2012-2014)—enlarged prints of various fingerprint patterns, which are derived from routine tasks performed upon a touch-screen device. The image selected for this exhibition, Next, Next, Next (2014) speaks directly to the inundation of visual information that requires the simplest and most general of movements in order to encourage prolonged viewing of new content. 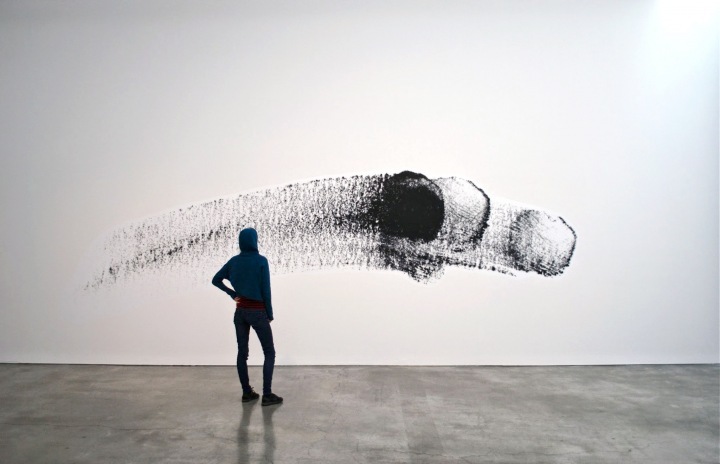 Oversized and at eye-level, the fingerprint pattern of Next, Next, Next draws attention to an emergent language of both communication and gestural movements that are unique to the 21st century. Exploring how popular forms of passive, mundane engagement operate within contemporary networked culture, Roth’s Multi-Touch Paintings make visual the conflation of obscure personal information (epitomized by the fingerprint) and idle activity. Such gestures are are often made in successive, yet seemingly inconsequential ways that are nonetheless valuable elsewhere—whether as an unwitting contribution to page views or to a personal data profile. Online “engagement” as Roth’s works so deftly remind us, are reduceable to a few casual taps or swipes of the finger, many of which are made because they seemingly have no consequence, yet offer some semblance of connection or engagement. Recognizing that the rapid exchange of information on the web is a new historical experience, Roth responds to this contemporary media climate by generating a body of work that is intended to be understood rapidly, if also at varying levels of depth. Intended to be experienced in at least three temporalities (online, in a gallery, and within a historical context), Roth’s oeuvre is reflects the signposts of a moment that demands multiplicity in order to have social and historical relevance.